Hexapods provide motion in all 6 Degrees of Freedom, X,Y,Z, Pitch, Roll, Yaw. 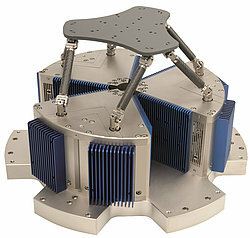 6-DoF motion platforms and positioning systems are often referred to as Stewart Platforms. Hexapod motion is based on 6 actuators arranged in parallel between a top and bottom platform. 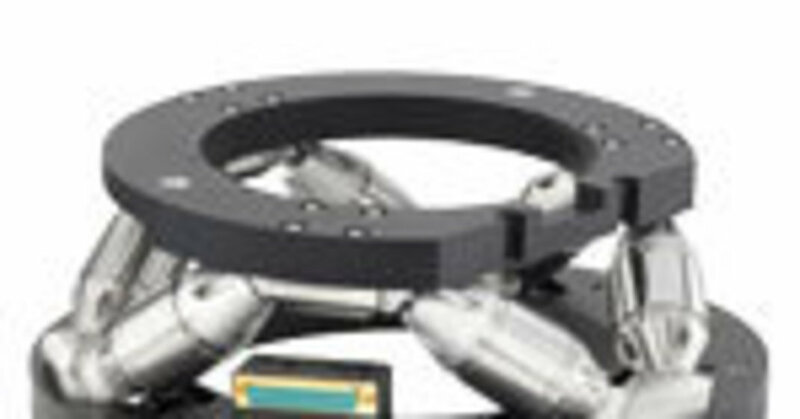 PI parallel kinematics (PKM) precision positioning systems have many advantages over conventional 6-axis positioners (serial kinematics stages), such as lower mass and inertia, improved dynamics, smaller package size, and higher stiffness. 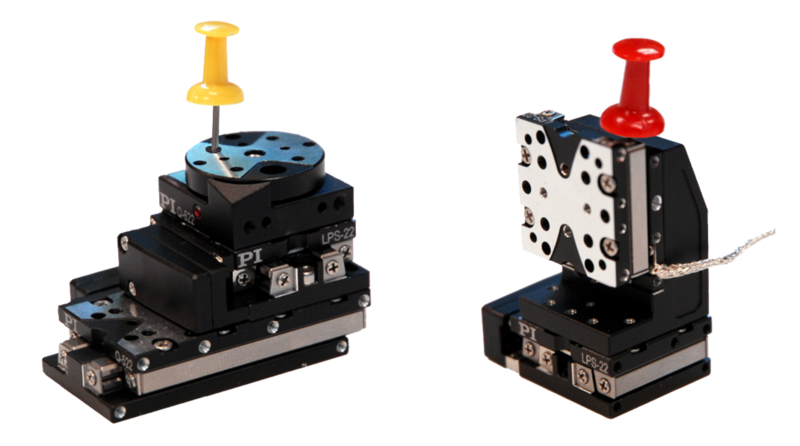 PI Hexapods come in different sizes, speed, load and precision specifications, a few standard models are shown above. Why should I use a Hexapod? Can it operate in any orientation? How do I control a Hexapod? How fast can the Hexapod Platform move? What are some common applications for Hexapods? What software support is available? What environments can a PI hexapod operate within? I only need 4 or 5 Degrees of Freedom! What if I need additional travel in one or more axes? Is a Hexapod stiffer than conventional stages? Can I program it in LabView? How do I synchronize all axes? Can the hexapod bind up? Can it be controlled manually? Are all Hexapods created equal? What are the advantages of working with PI? What is the smallest PI hexapod? 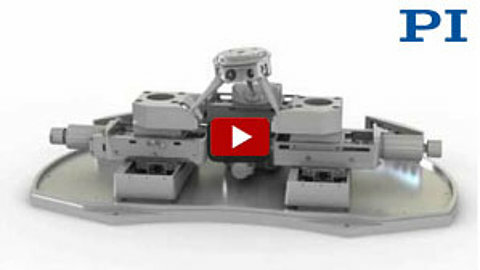 There are two ways to get multi-axis motion – stack individual stages or use a hexapod. Customers typically choose the hexapod approach for the higher stiffness and virtual pivot point. Higher stiffness comes from 6 actuators moving a single platform directly. With higher stiffness comes better stability due to higher resonant frequency and a better ability to make short, fast moves due to lower moving mass. With a hexapod the center of rotation is defined in software by the algorithms that coordinate leg motion. By comparison in a multi-axis stage configuration the center of rotation is defined by choice of bearings and alignment of stage axes. The hexapod “Virtual Pivot Point” allows a customer to choose the center of rotation based on the application. In many cases an optically significant point. 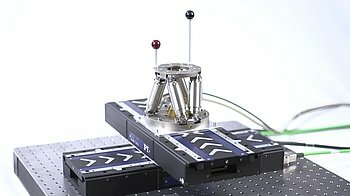 Upside-down hexapod setup for evaluating highly precise bioelectrode positioning. PI hexapods are designed to run in any orientation. They do not rely on external springs for preloading that would weaken if run upside down. The load capacity varies with the orientation. PI provides simulation software to exactly calculate the forces on each actuator for any orientation. How Do I Control The Hexapod? Yes! The PI controller coordinates the motion of each leg to create smooth motion at the platform. Further, PI hexapods have vector path planning so the hexapod can follow a customer-defined trajectory. PI hexapods can achieve smooth motion, take a vector path, and follow defined trajectories due to the combination of mechanical and control technologies. 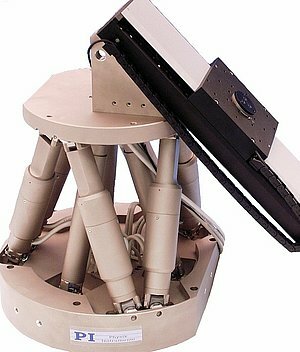 PI Hexapod joints allow full range of motion while achieving the required precision. This requires careful design and specification of joint geometry and bearing tolerances. PI Hexapod Controllers coordinate the individual leg motions in firmware to achieve precise, smooth motion along the desired trajectory. This takes hundreds of thousands of calculations per second. The fastest hexapods PI makes are driven by voice coil linear motors. These 6DOF motion platforms provide dynamics up to 100 Hz and are often used to simulate motion such as hand tremble, vehicular vibrations, vessel motions, drone motions etc. For more information read Hexapod in Camera Testing and Hexapod 6DOF Motion Platform in Drone Testing. PI has been building hexapods for over 20 years – we started with custom hexapods for large telescopes. Today, PI builds hexapods for industrial and scientific applications because they are cost-effective and robust. PI hexapods start under $30,000; most are in the $40,000 to $60,000 range. Very large, high load, high precision hexapods can run higher. Hexapods are also more precise than a stack of stages. When you set up a stage based multi-axis system, typically the precision per axis is specified. However, the overall precision is significantly lower, because runout, angular errors and flex in the individual axes can multiply at the functional point of motion. When comparing prices, consider PI hexapods are complete systems with controller, cables, and software. All PI Hexapods include a controller, cables, software, and documentation. The controller is a special hexapod controller with internal coordinate transformation and path planning, refined over more than 2 decades of hexapod design & manufacture at PI. In addition to PI’s MikroMove start-up software, LabView drivers, Windows DLLs, and programming examples are included. PI also provides work space simulation software. With PI’s Virtual Hexapod machine, customers can start to test their own programs before the hexapod delivery. 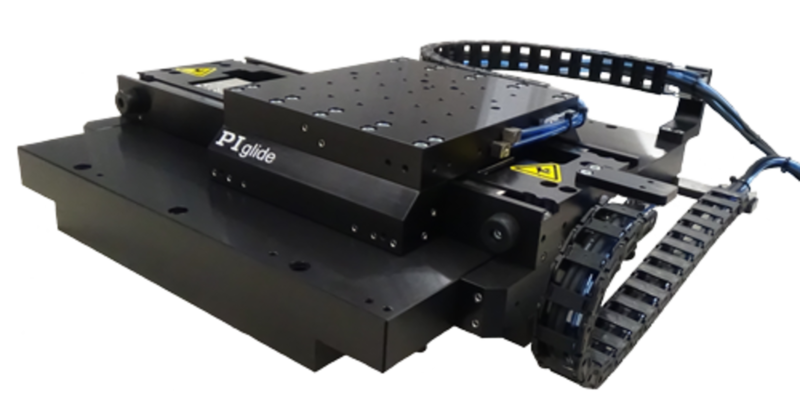 Optionally available is PI’s advanced PIVeriMove collision avoidance software, in case the hexapod is used in a confined space with external obstacles. Hexapods use the PI General Command Set (GCS). GCS provides numerous preprogrammed functions to accelerate the orientation and application development phase significantly. GCS is consistent for all PI motion controllers. Is a very powerful graphical program ensuring rapid start-up right out of the box. It also integrates a Macro language, scan/align algorithms, and a data recorder for system analysis. PI provides complete open source LabVIEW drivers sets to facilitate programming. All common programming languages under Windows & Linux with libraries and code examples. Determine work space and permissible load under different Hexapod orientations. 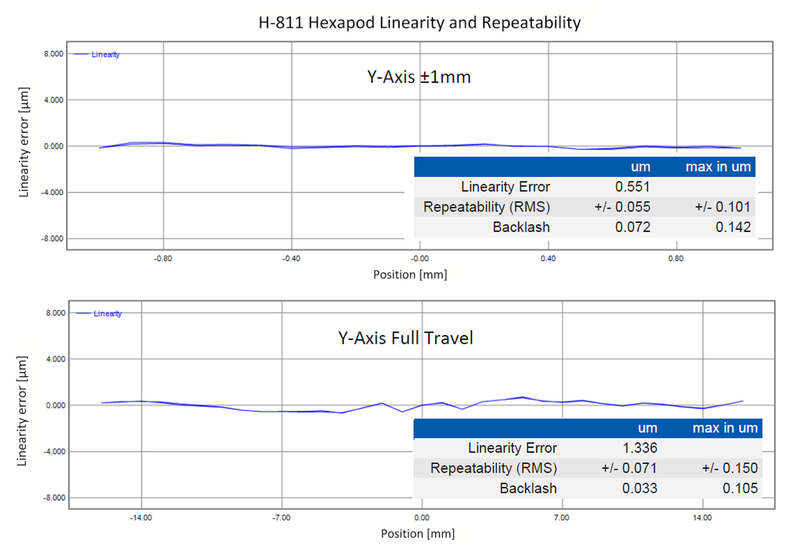 A special software tool included with each PI Hexapod calculates and displays the limits graphically. Saves cost and time because application programs can be developed and tested on the customer’s PC, before Hexapod delivery. VM emulates mechanics, controller and peripherals. Enables simulation of the Hexapod in the application environment to avoid positions where the Hexapod / load would collide with the surroundings. Import of peripheral objects via CAD data. 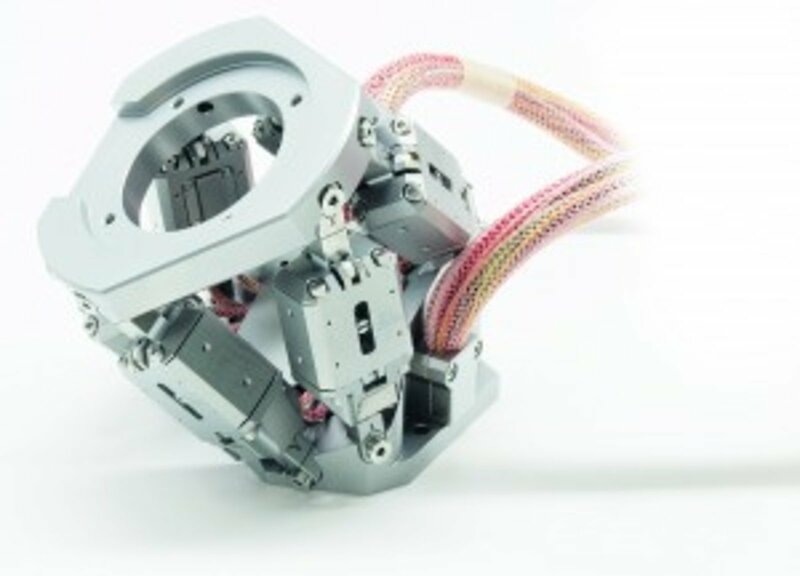 A miniature, UHV-compatible, nonmagnetic hexapod based on PiezoWalk® actuators and flexure joints. PI Hexapods are available for different environments. 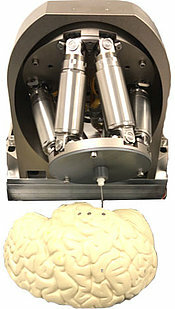 A vacuum option for 10-6 Torr is standard for most hexapods, and custom versions up to 10-9 Torr are available on request. Also, with PI’s piezo ceramic motor expertise, non-magnetic and EUV compatible Hexapods are feasible, as well as wide temperature ranges. A Hexapod will always have 6-degrees of freedom. In many cases the stiffness and virtual pivot point capability of a hexapod make it a better choice in 4 and 5 degree of freedom applications. In many more cases, 4 and 5 degree of freedom applications are better suited to a stack of 1-axis stages. In which case, there is a good selection of PI stages to choose from. 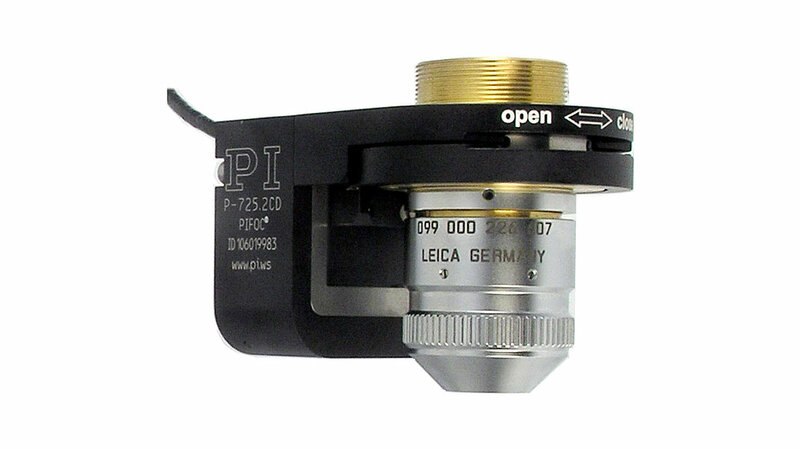 And in either case, PI will seek to understand the requirements of your application and help you make a good choice about the precision motion design path. All PI hexapod controllers can handle 6+2 axes. In addition, the hexapod two more linear or rotary stages can be controlled. Linear Positioning Stages can be used to extend the planar range if required, or rotary axes can be added for 360 degree motion. Custom Hexapod with additional long travel linear stage and additional measuring legs for redundancy (medical application). PI’s modular PlanarPod (SpaceFAB) design allows even greater flexibility. Here the travel range of the X and/or Y axes is only limited by the length of the linear stages used. 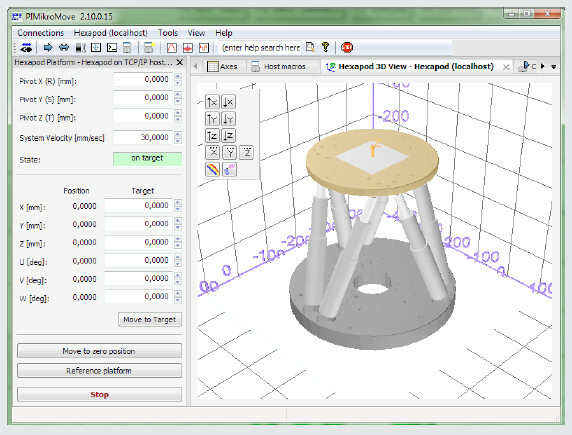 Unlike a stack of conventional positioning stages, servo parameters of PI hexapods usually never have to be tweaked. This is in part due to the parallel kinematics nature, where the load is symmetrically divided between all actuators. There is only one common moving platform and because of the very high system stiffness, the servo is much more forgiving. If it needs to be tuned, the parameters are identical for all 6 axes, another advantage over serial kinematics. PI hexapods are significantly stiffer than a stack of 6 individual stages. The moving platform is also significantly lighter than the sum of the individual stages. 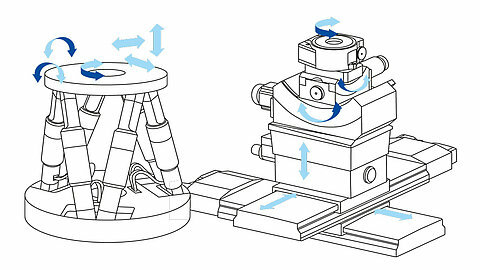 Consider that the bottom stage in conventional 6-axis positioner has to move 5 stages plus the mass of its own platform. As a result, the high stiffness and very low inertia make a system that is very stable and extremely responsive to motion input. Yes, PI provides a complete software package with Open source LabVIEW drivers. We are always up-to-date with the latest Labview drivers, offer them free with the controller, and many of our customer use Labview successfully with our support from Auburn, MA or Irvine, CA. PI hexapods are very reliable. There are no exotic or overly sensitive parts used in our hexapods. No dragged cables, 6 identical actuators, precision high load bearings, design and manufacturing continually improved over more than 20 years. PI’s own dedicated Hexapod controller makes it independent of 3rd party firmware of hardware changes. You don’t have to worry about that, it is all handled internally in the hexapod controller. The controller synchronizes the individual legs thousands of times per second. This is completely transparent to the user who only enters desired motion coordinates of the top platform. No. PI hexapods are designed without singularities and will not bind up. Yes, there are two ways: with the optional manual control pad, and wirelessly, with the free iPad hexapod app. No. There are many ways to build a hexapod. PI offers several designs with passive and active struts, self-locking hexapods, servo motor-driven, and piezo-motor driven ones, etc. The SpaceFAB planar 6-axis design provides longer travel in the XY plane and a lower profile, at slightly reduced angular travel ranges. 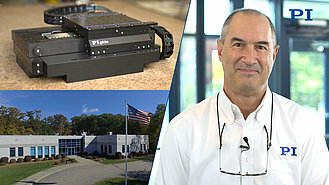 Experience: Since the early 1990’s, PI has built more micropositioning and nanopositioning hexapods than anybody else in the world. Performance: The performance of a hexapod depends largely on the precision of the joints. PI designs and manufactures custom joints, e.g. offset cardanic joints for the highest possible stiffness, or flexure joints for nanometer precision applications. Next to the joints, a lot of the precision comes down to the metrology, math and controller. Here again, coming to this from the nano-world, PI’s test & metrology equipment and experience makes the difference. You get a complete package and PI’s expert global support. Q-821, 6-axis parallel manipulator, fits in an envelope of 80x80x48 mm³. 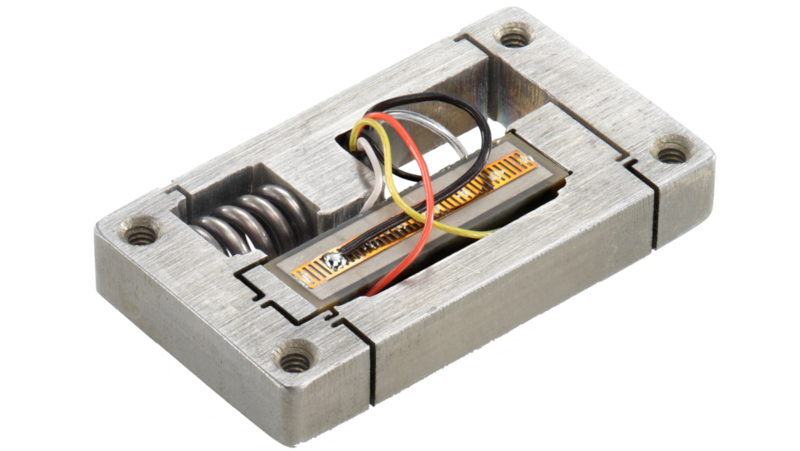 Currently, our smallest hexapod is the Q-821 piezo motor driven 6-axis parallel positioner – actually not a hexapod, but parallel kinematics design with similar performance to traditional hexapods. The Q-821 is based on three XY piezo inertia motor-driven motors driving a tri-pod. A somewhat larger version – the Q-845 is also available. Read article on its application as a parallel manipulator for X-ray diffraction imaging in a beamline.